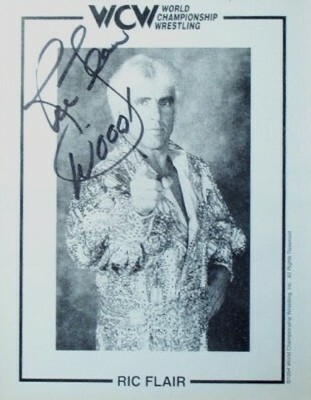 Here is a signed Ric Flair WCW publicity photo. I waited for about 2 hours in line to meet The Nature Boy at the Natick Mall in Natick Massachusetts. He was there doing a publicity stop for WCW during Nitro's biggest years. The Giant (Paul Wight, The Big Show) was also there. When I finally got to meet Ric, I asked him if he could put a Woo on the autograph for me. Some lady, who must have been with security said, "I'm sorry sir, there are not doing personalized autographs today." Flair looked at the lady like she had three heads and proceeded to put a Wooooooo! on my autograph. He was very nice to do that. Flair is considered by many, myself included, to be the greatest professional wrestler of all time.